ADDIS ABABA, Ethiopia — Ethio­pian Prime Minister Abiy Ahmed traveled Sunday to Eritrea, once a bitter adversary, and agreed to normalize ties after an unprecedented summit. The rapprochement between the two neighbors could have far-reaching consequences for improving the stability of the Horn of Africa, which is home to several conflicts and environmental crises. The two nations, sworn enemies for two decades, fought a brutal war from 1998 to 2000 in which at least 70,000 people were killed. In the intervening years, the two sides have clashed repeatedly and supported rival rebel movements. 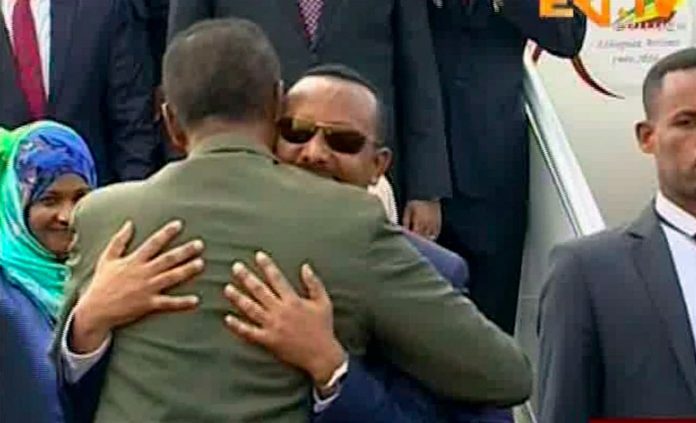 Abiy was hugged by Eritrean President Isaias Afwerki at the airport in Asmara, the Eritrean capital, and they smiled and laughed as they strode past the uniformed band and honor guard. The friendly welcome set the tone for the visit as the two men were shown several times on Eritrean state television smiling together before announcing at an evening banquet that relations will be normalized. The two countries will reopen embassies, restore flight links and allow direct telephone calls. Landlocked Ethi­o­pia will look to start using Eritrea’s Red Sea ports. Abiy, who came to power in April and has already turned Ethiopia’s stagnant political scene on its head, has frequently preached about love and unity in his speeches in Ethi­o­pia. The convoy of vehicles that carried him from the airport through downtown Asmara was swamped by loudly cheering crowds that spilled onto the road and slowed the cars to a crawl. The change in relations has stunned observers. Hallelujah Lulie, a political analyst specializing in the Horn of Africa, said the two countries had come to the realization that the status quo — no war, no peace — could not continue. As Eritrea’s relations with the West and Arab countries improved, it also became more open to rapprochement. In Ethi­o­pia, the accession of Abiy, who represented a break from the party that once conducted the war with Eritrea, also made it easier to find an end to the stalemate. Hallelujah added that mediation over the past month from Saudi Arabia and the United Arab Emirates, which have increasingly close ties to Eritrea, probably helped create the breakthrough. Abiy broke the deadlock between the two countries Thursday by accepting the 2000 peace agreement that ended the war, which would involve ceding territory still held by Ethi­o­pia. Events moved quickly after that, with Isaias accepting Abiy’s overtures as a “positive” move and sending a delegation led by his foreign minister to Addis Ababa a week later. The normalization of ties notwithstanding, the complex process of returning disputed territory and figuring out what happens to the people living there still lies ahead. Under Abiy, Ethi­o­pia appears to be embarking on a path of reform, but Eritrea has been characterized as one of the most authoritarian and closed states in Africa. For much of the past 20 years, Eritrea has been focused on its conflict with Ethi­o­pia, with substantial spending on its military and indefinite mandatory military service that has led hundreds of thousands of Eritreans to try to immigrate to Europe. The end of the conflict could open the way not only for the end of mandatory conscription in Eritrea but also a return to democratic provisions in the constitution that were suspended, including elections. “There won’t be radical change, but some reforms could be on the horizon,” Hallelujah said.